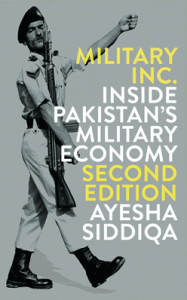 Ayesha Siddiqa is an independent scholar, an author and a columnist with a specialization in military affairs and politics of South Asia and Islam. Known for her bold writings on issues that people dare not touch, she did her Ph.D. from the Department of War Studies, King’s College, University of London. 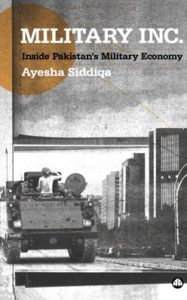 She is known for her groundbreaking work on military decision-making, political economy of defense in Pakistan, and theory of military business internationally. 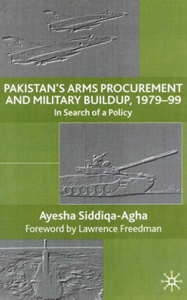 The American Institute of Pakistan Studies (AIPS) recognized her work by giving an award for her book in 2008. Her work stands out for being bold and taking up issues that few dare to analyze in such depth. She travels extensively lecturing at universities around the world and speaking at seminars and conferences. She has taught at Quaid-e- Azam University, Islamabad, Lahore University of Management Sciences (LUMS), University of Pennsylvania and at the School for Advanced International Studies, Johns Hopkins University. She was the inaugural Pakistan Fellow at the Woodrow Wilson International Center for Scholars WWICS), Charles Wallace Fellow at St Antony’s College, Oxford University, Ford Fellow at the Bonn International Center for Conversion, and Research Fellow at the Cooperative Monitoring Center, Sandia National Laboratories, New Mexico. Her career includes experience of public policy and administration as she spent eleven years as part of the Pakistan civil service where she worked at various positions in military accounts, defense audit, and as director of naval research at the Naval headquarters, Islamabad. She was also advisor to the Chairman National Accountability Bureau (NAB), the foremost anti-corruption body in Pakistan. She is currently a research associate with the South Asia Institute of the School for Oriental and African Studies, University of London.